TEMPORARILY OUT OF STOCK...Personalized lunch cooler tote bag. 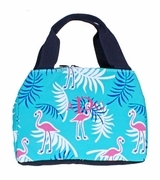 Stylish summer seahorse shell pattern with insulated interior. Vinyl lined compartment for cold drinks and lunch. Water resistant exterior, front open pocket for small essentials. Side mesh water bottle holder and adjustable over the shoulder carry strap. Add personalization with name or three letter monogram. Upscale and colorful seahorse shell print fabric.